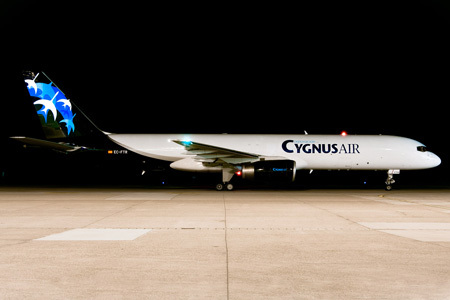 Gestair Cargo (Madrid) has rebranded back to its original name of Cygnus Air Corporacion. The airline is currently owned by the Macholfam International (Grupo Gestair) (60%) and IMES (Grupo ACS) (40%) according to Wikipedia. Top Copyright Photo: Ole Simon/AirlinersGallery.com. This Gestair Cargo color scheme and name was introduced in 2008. Bottom Copyright Photo: Gunter Mayer. Now ex-Iberia Boeing 757-236 EC-KLD (msn 24121), pictured at Nuremberg at night, is wearing the basic Gestair livery now with Cygnus Air Corporacion titles and the new (old) tail logo. This entry was posted in Cygnus Air, Gestair Cargo and tagged 24121, 757, 757200, 757200F, 757236, Boeing, Boeing 757, Boeing 757200, Boeing 757200F, Cygnus Air, ECKLD, Gestair, Gestair Cargo, MAD, Madrid on June 29, 2013 by Bruce Drum. TNT (Gestair Cargo) Boeing 767-383 ER (F) EC-LKI (msn 26544) MST (Bjorn van der Velpen) (new type), originally uploaded by Airliners Gallery. 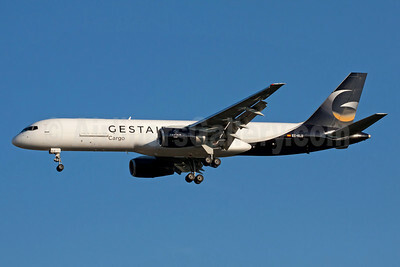 Gestair Cargo (Madrid) will operate this Boeing 767-383 ER (F) EC-LKI (msn 26544) for TNT. Copyright Photo: Bjorn van der Velpen. Please click on the photo for additional details. This entry was posted in Gestair Cargo, TNT Airways and tagged Gestair Cargo, TNT Airways on January 5, 2011 by Bruce Drum.